Google Translate app for Android updated with useful features including Phrasebook Syncing and more language support for Camera-input mode. The app is quite useful if you are in a foreign land and you don’t know the language, in those situations you may need some basic phrases quickly to survive. 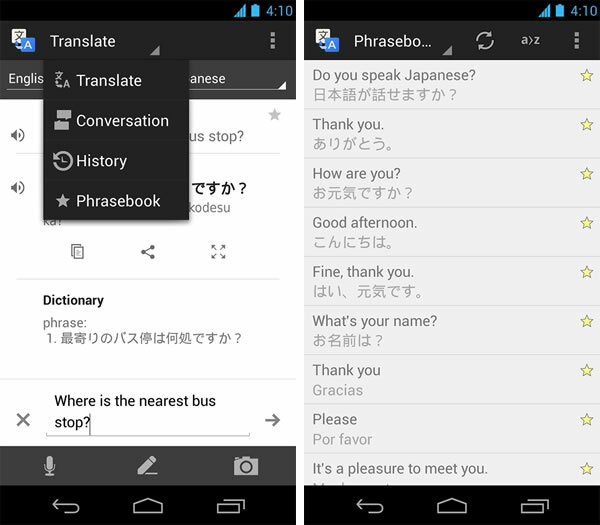 With the phrasebook syncing you can now keep your phrases at hand when you need the most in a foreign land. To access select Phrasebook from the menu, your favorites menu item has gone and is being replaced by the Phrasebook, now all your stored phrases are part of it. To gain access to it first sign-in with your Google account. Another interesting and most useful feature is that the Camera-input mode now supports 16 more languages including Bulgarian, Catalan, Danish, Estonian, Finnish, Croatian, Hungarian, Indonesian, Icelandic, Lithuanian, Latvian, Norwegian, Romanian, Slovak, Slovenian, and Swedish. Google introduced this feature last year it allows users to point to any text to see the translation of it. Google uses OCR technology to accomplish the text scanning. To remind you Google Translate has an offline mode where you can use the app to get translation even if you don’t have the data connection. For this feature you need to download the language packs before hand.